Online sales made through FatWallet to retailers offering products for the home have risen more than 200% since 2010 during 4th of July sales. July 4th sales mark the kick-off of summer clearance and bring a week long run of deep discounts on summer necessities and smart shoppers will jump on price-reduced, limited inventory while stacking added savings with increased cash back via FatWallet. FatWallet presents 4th of July Deals, offering online bargain hunters a one-stop online resource to compare and shop for timely summer savings from hundreds of retailers. The promotion has produced 52% more sales to participating retailers and 55% more cash back to online shoppers since 2010, including a 206% increase in sales for home and garden products made through FatWallet during the 4th of July sales. This year’s promotion features 10-50% discounts on a variety of items from outdoor gear, games and toys, to laptops, patio furnishings and home appliances. 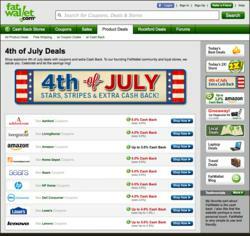 FatWallet lists hundreds of 4th of July coupons and deals from top retail stores like Lowe’s, Sears, Home Depot, Dell and HP that have generously increased cash back rewards for FatWallet members through July 6. Other categories that have seen online sales growth the past couple of years during this traditional sales event include computers and electronics. Surprisingly, laptops sales made through FatWallet during the first week in July have increased by more than 70% since 2010. “Although consumer electronics retailers are focusing for upcoming Back-to-School shopping season, they’ll all participate with 4th of July discounts, offering early-bird back to school shoppers an unseasonable opportunity to get their choice of quality laptops and HDTVs at a big savings,” continued Shelton. About FatWallet: As the preferred online shopping resource for millions of smart consumers, FatWallet.com works closely with 1,500+ retailers like 6PM, Kohl’s, Walmart and Amazon to publish special offers, discounts, coupon codes and Cash Back rewards to its members. The much celebrated FatWallet forums represent the pulse of an evolving online marketplace where smart consumers gather to share and learn. FatWallet is owned by Performance Marketing Brands (PMB) who owns and operates the world's most rewarding shopping programs. Through its family of distinct websites and reward programs, PMB users can get a great deal and earn money back every time they shop. PMB shoppers are expected to spend over $2 billion through PMB's websites and shopping programs. Contact Brent Shelton at bshelton(at)fatwallet(dot)com for more information.